All of God's creatures have rights, a fact that most people don't seem to recognize. This includes both human and non-human animals, but not all of them can speak for themselves. As we continue to disregard the value of the lives of the billions of animals we eat, we also are destroying our air, land and water. This past winter, we had minus-50-degree weather with the wind chill. Can you imagine if you were in the back of a trailer that's open and the wind-chill factor is minus 50 degrees, and that trailer is going 50 to 60 miles an hour? As many parts of the nation cope with staying warm in sub-freezing temperatures, it's disturbing but important to remember that farmed animals have virtually no protection from the elements during transport to slaughter. Just take a look at this harrowing video filmed by Canadian activists in Toronto. During a vigil held for animals on their way to slaughter, activists stood on the side of the road in -20ºC weather (-4ºF) and documented pigs being shipped in trucks with no climate control. There is barely even any hay inside the cars for the pigs to cover up and stay warm. 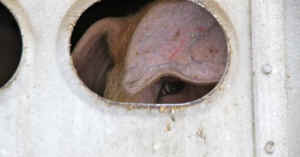 One shot shows what appears to be frostbite on a pig's ears. Such brutal transport is also endured by pigs here in the United States. One can only imagine the suffering of these animals, being exposed to such extreme temperatures for several hours, sometimes over hundreds of miles. In Gail Eisnitz's book Slaughterhouse, Dr. Lester Friedlander, a former USDA veterinarian, expressed his concern: "This past winter, we had minus-50-degree weather with the wind chill. Can you imagine if you were in the back of a trailer that's open and the wind-chill factor is minus 50 degrees, and that trailer is going 50 to 60 miles an hour?" The best way to ensure animals don't have to suffer such horrific conditions is to adopt a cruelty-free, vegan diet. For more information visit ChooseVeg.com. Number of animals killed in the world by the fishing, meat, dairy and egg industries, since you opened this webpage.